Are you shopping for a foodie this holiday season? Consider giving them a subscription to RawSpiceBar – a subscription box filled with freshly ground spices from around the globe. Last year, I bought a gift subscription for a friend who loves to cook. I wanted something unique and RawSpiceBar fit the bill perfectly. They offer a quarterly spice subscription that you can customize to your tastes. Then, every quarter, they will send you six freshly ground, seasonal spices and blends along with delicious recipes to use your new spices in! RawSpiceBar is one of the more affordable subscription boxes I’ve seen (and I’ve seen many). The cost is $88/year or $26/quarter. Shipping is free in the USA. They also ship to Canada, but you will need to pay for shipping. They also sell spices on their site so if you have something in mind that you need, check them out. I’ve tried their spices before and was impressed with the quality of flavour. 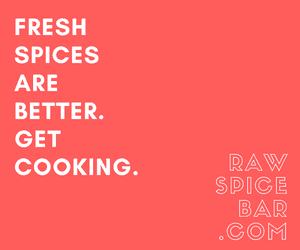 Visit RawSpiceBar to learn more and to purchase a subscription or some spices! Are you shopping for any foodies this holiday season? Freshly ground is so good. I can’t wait to try it. I hope to score it. Would love to try the Ethiopian spices! I learned Raw Spice has a much larger selection than I imagined!! I like that they have a Spices Guide. I learned about a lot of spices that I had never heard of . I had never heard of Cubeb Pepper before. Now, I am greatly intrigued. I really like the wide diversity of spices and appreciate that so many are offered in whole form (to keep more of the essential oils intact longer). I also really want to try some of the Grains of Paradise at some point soon. I love all of their Indian spices! I learned that they start you off with 6 seasonal, freshly ground spices & blends, to cook 2 meals/week for 4. I love all of their Indian spices!! They have recipes for all diets. Huge variety/many different types of high quality spices. Looks like a neat service. I learned that you can get small batch spices shipped .quarterly. The spice sets would make a great gift. I like the Granulated Garlic! have tried them, love the variety! I would like to try the texas style spice rub. Thanks! I am looking for GARAM MASALA, FRESHLY GROUND. Yum. The INDIAN SPICES & BLENDS SET looks like fun. I like how they give recipes for their spices. They grind to order and only send a small amount so that you don’t have tons leftover. Genius!! I love that the spices sent come with recipes to try. I love to try new things. I love the combination of spices with the provided recipes. It is most helpful. I learned that they carry a large variety of spices. I’m interested in trying the Garam Marsala spice in my cooking. I would like to try the CAYENNE PEPPER, NATURALLY ORGANIC. I think it’s pretty cool that the spices are freshly ground! I like the small batches. I learned that there are recipes for all diets. I like the Baking Essentials Spice Set. RawSpiceBar has so many more fresh spices than my local store has. Fresh spices have so much more flavor.